National Quilting Day for our friends south of the border (the Canada-U.S. border, that is). I'm going to make a little suggestion that maybe everyone could find a way to squeeze a little plug for our passion into a conversation tomorrow. Even better, take half an hour and teach a small person to do running stitch and sew two pieces of fabric together. Or stitch a line with embroidery floss around the neck of a t-shirt to jazz it up. I have found it very easy to teach kids to embroider...the hardest part being the up and down of the needle instead of "up and around" whereby the floss ends up in giant loops around the hoop. Look what Heidi's boys did on their spring break with embroidery floss (or don't look if you are not a fan of long skinny slithery things). Super cool! When I taught people to embroider at SORR last weekend, I brought this sampler with me so they could see a few different stitches and decide which ones to try out. I love this post! It is fun to teach kids to stitch. My 6 and 8 year old boys love to stitch along with me. And you are right, Heidi's boys did a super job! 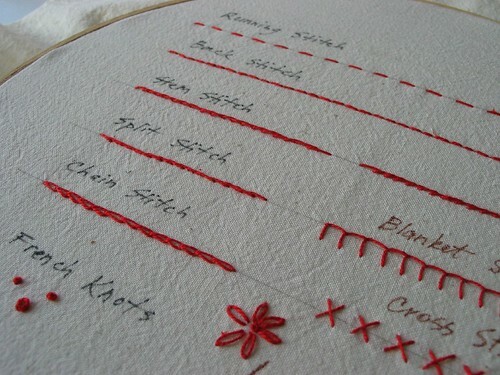 Great stitch sampler! I agree, being able to see the topic at hand makes everything so much easier to teach. That was a great sampler that you brought...I am sure that they loved it! Boy could I use that class!! I can't do a french knot to save my life. I love your lil' chicks at the top of your blog! Adorable!